Four great new domain extensions you can register now with Layershift. 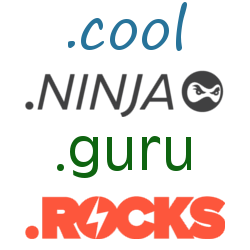 Starting today we’re offering .guru, .ninja, .rocks and .cool domain name registration in our store! These new TLDs give you the opportunity to send your message in a more targeted and fun way than before: on each side of the dot there is a powerful word. If you’re a security expert, you can say it loud with security.guru or be a plumbing.ninja! Or perhaps you just want to recall your Gaelic roots with sham.rocks? Each of these domains offer a fresh new namespace where you’re more likely to get that killer name before anyone else, so you can be the one receiving the admiring glances after coming up with the cunning rhyme or inspired prefix. Step right up and register yours today at our domain store – as always, our domain registrations are offered at some of the lowest prices anywhere on the ‘net. Register your .guru domain today! Declare your unrivalled expertise to the world with .guru – a universal domain with no registration restrictions or complications. Feel more like a .ninja? Frequently used in technical circles, you can become a database.ninja in no time at all. A new TLD that .rocks – get yours now! Got the .cool summer vibe? This TLD really speaks for itself! Show off your daddy.cool website to the whole world. Want to see different TLDs added to our service, or have any other questions about our domain registrar services? We’re here to help, so please don’t hesitate to contact us!